The Hebe Society was founded in 1985 and is a British Registered Charity. 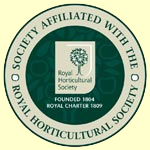 It is affiliated to the Royal Horticultural Society, New Zealand Alpine Garden Society and Tatton Garden Society. Most members are in the British Isles, but some are in the rest of Europe, North America and New Zealand. Other collections are at: Victoria Park, Haywards Heath, East Sussex and Lovell Quinta Arboretum, Cheshire.